White is the new ‘it’ matte color that is not really a color at all. Matte white nails are popping up all over, and they’re awesomely edgy. Who doesn`t want to have neat and attractive nails, which will not spoil the whole image, but complement it? Every modern person knows that an ideal manicure is one of the main requirements to look tidy and up-to-date! The most important question, disturbing each fashionistas, is how to choose the most appropriate manicure from the variety of possible nail designs. Nobody will argue that, despite the wide range of colors for nails, nails of the white color are still popular! This is due to their versatility and attractiveness! The white color has always been associated with the purity and exquisiteness. The white color compliments any skin tone a lot! As you can notice, the tendency to cover nails with a glossy polish isn`t very popular nowadays. Nevertheless, this is not a problem! White matte nails are on trend! The matte effect makes your white nails softer and dim. The matte finish over the white base leaves the most natural look! The mixture of the classic white color and the modern matte effect attracts with its creativity and pureness. Besides, the matte polish, applying with the white one creates an unobtrusive, but great manicure! A manicure with white matte nails is in great demand among those, who like minimalistic style. In addition, it`s an excellent background for any design you want. White matte nails are really timeless! Don`t think that white nails are boring or lifeless! White means classic, not the lack of fantasy! Nowadays you have a lot of opportunities to make white nails fun and creative. The matte nails of the white color give you an opportunity to combine them with black, red, green, purple, blue, orange…! White matte nails look equally good both only with this color and combined with other ones! Isn`t an unquestionable advantage? 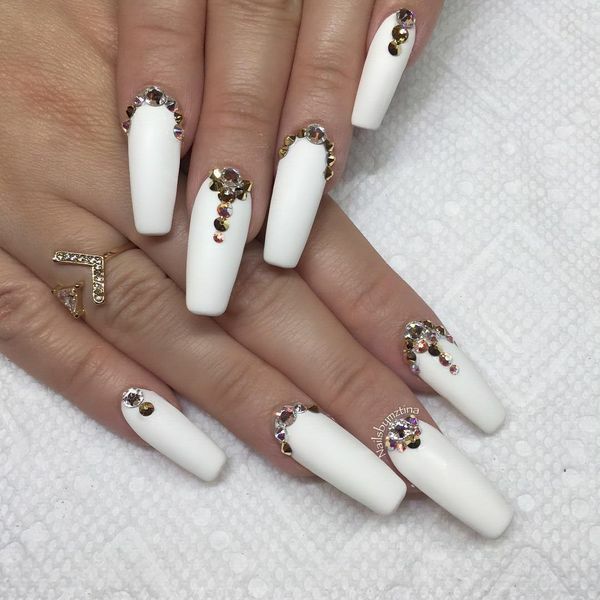 Furthermore, such nail accessories as rhinestones and crystals, stripes and studs, bows and glitters, and many other variants of décor are widely used for decorating white matte nails.